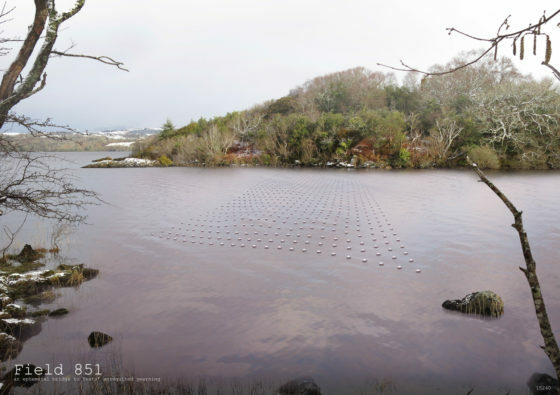 Field 851 was a conceptual response in collaboration with Kevin O’Brien Architects, to the Yeats 2015 open submission architectural competition calling for an artistic intervention to be placed on or around the lake isle of Innisfree. outstretched fingers on an ancient chapel ceiling. glitch in the matrix, like a momentary arising of the Akasha. You wonder if it is caused by the tension existent between the island and the mainland, like the static electric when two masses get close enough, like the atomic experiments at CERN. pool and you are transported. 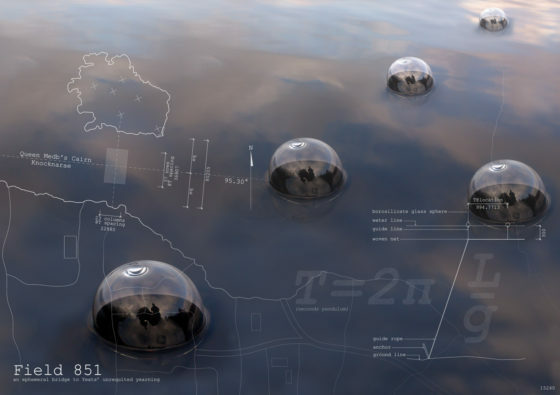 transference, and reference to early metaphysical laboratory experiments. as the wind blows and the water starts to move, it becomes more organic in nature, constantly moving between these two states in response to the universal forces acting upon it. Materials: Borosilicate Glass, Natural Fibre, stainless steel anchors.